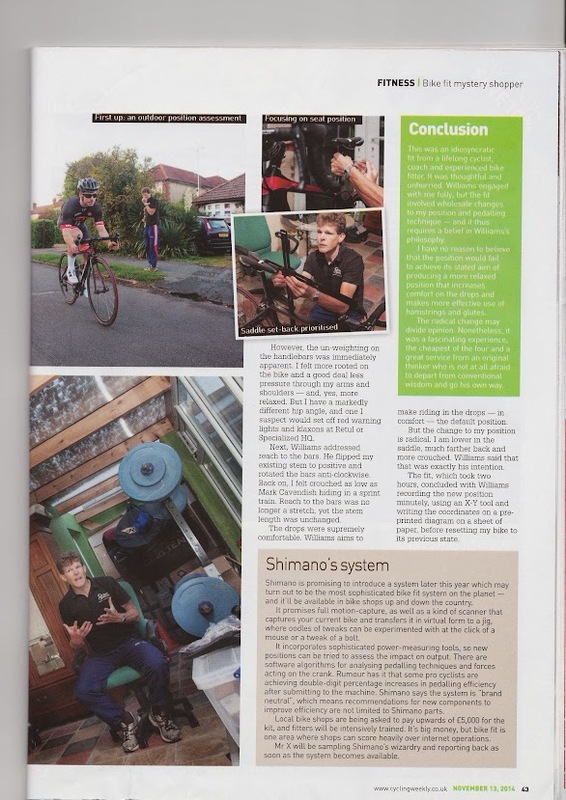 Back in the summer of 2014 one of my bike fit clients got back in touch soon after driving away to confess that he came for his fitting as a 'mystery shopper' from Cycling Weekly. Though he wrote his article straight away it didn't appear in the magazine until November. Unfortunately the Mystery Shopper took his bike away with its original set up and wrote his item without trying mine. He experienced and wrote about the fitting process, but my service is much more than the two hours that my clients spend with me. 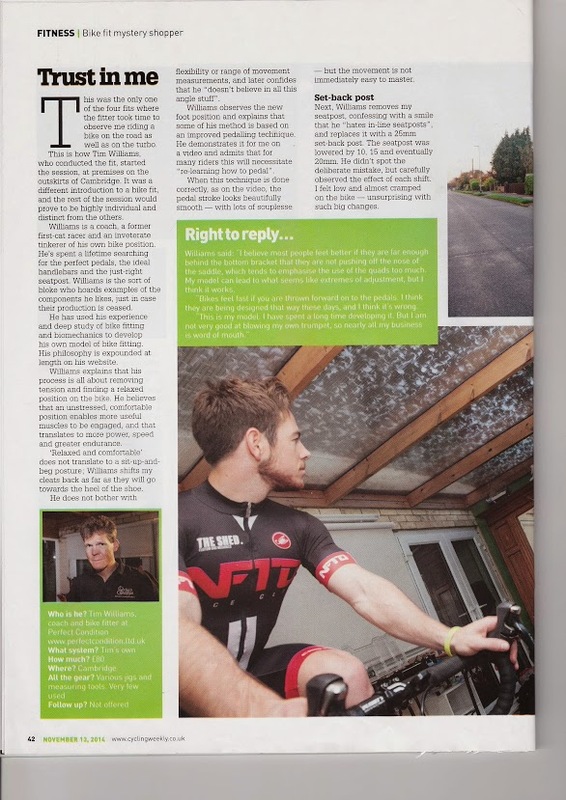 In the words of one of several who contacted me after reading the article... "[Cycling Weekly] failed readers in the most important aspect, I think, which is 'proof of the pudding' over a period after bike fitting." The Mystery Shopper might have felt "almost cramped" part way through, but by the end "the drops were supremely comfortable" and he was "as low as Mark Cavendish hiding in a sprint train". I've done over 500 bike fits since I packed in my old day job a few years ago, and the vast majority of my customers have come through word of mouth. The position makes even more sense on the road. I think that he quoted me out of context on a few things too: "[Williams] doesn't believe in all this angle stuff" he said. On the contrary - I think that flexibility and angles are extremely important. I just don't think that as an experienced and skilled fitter and coach I need a computer to work them out for me. So what's the big deal about hip angle anyway? Why would my setup have set off klaxons at Retul and Specialized HQ? And why do I think that they are wrong? Here's a picture of cyclist in action. I think that this is a pretty good set up. He can ride it for hours at a time on the drops and the hoods. It's pretty streamlined and very relaxed. He can easily take one or both hands off the bars and it's great for fast corners, fast descents, bumpy roads and riding on a wheel in the gutter. The Mystery Shopper described the pedal stroke as 'beautifully smooth'. As you can see, Retul just joins the dots. And the warning lights start flashing. That hip angle is waaay too closed. But like most real people, our rider has a spine. And if you were to run your fingers along the top of his back you'd find that his spine is nowhere near the straight line that Retul sees. 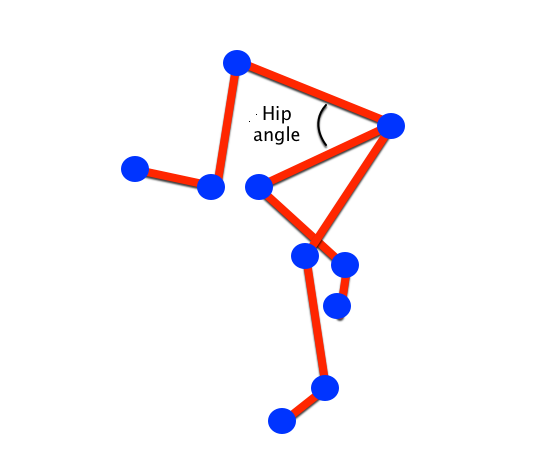 I've approximated where it is in the picture below. My understanding of the 'hip angle' dogma is that it has its origins in Triathlon. Triathletes were thought to run better off the bike if they rode with a more open hip angle. ...but they were riding with tribars and the dynamics of riding with the elbows supported is completely different. When triathletes don't have tribars, as is the case in draft-legal racing, the story changes somewhat. Here is a photo of the fastest running triathlete in the world (can you hear the klaxons?) 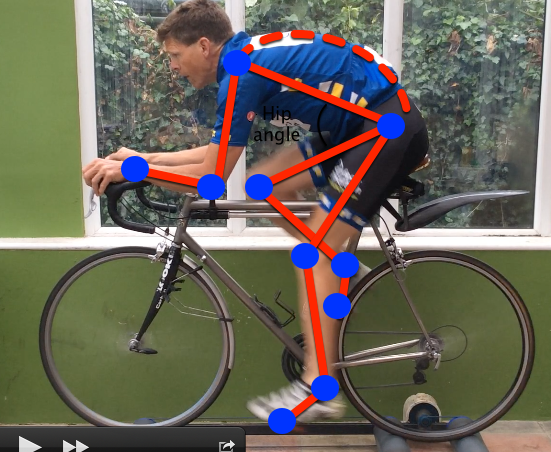 between two Retul compliant rivals with 'nice', open hip angles. Alistair Brownlee (for it is he) is also the best cycling triathlete, so evidently his hip angle isn't hindering either his cycling or his running. I didn't set Alistair's bike up, but I have set up and coached World and European Duathlon champions for both draft-legal and non-drafting racing. A more open hip angle is, in itself, not a problem. The problem is the side effects: If you open up your hip angle you sit more upright and cannot reach the handlebars - so you have to rotate forward around the bottom bracket by moving the saddle forward (and upward). This moves your centre of gravity forward and puts more pressure onto your hands and arms. It also brings your knees in front of the pedals such that you push yourself forward as you ride - further increasing the pressure on your hands and arms. This feels 'powerful' for a while, but leads to sore hands and tension (which becomes discomfort and then pain) in one or more of your arms, neck, shoulders, upper back and lower back. It makes riding on the drops for any length of time almost impossible and makes your bike 'twitchy' and stressful to ride in a big group or over bumpy roads. You also end up sitting on your perineum rather than your ischial tuberosities and unfairly blaming your saddle or your shorts for making you uncomfortable 'down below'. I just copied the pages about me. You might still be able to read the whole issue of Cycling Weekly here.